Autumn is not only a harvest season, but also a season for traveling. As temperatures drop and leaves turn yellow, China tourism heats up all over China. Here, we chooses the eight most beautiful destinations around the country for autumn sightseeing. Dongzhaigang Nature Reserve, located in the northeast part of Hainan Province, is the first and biggest mangrove nature reserve in China. The mangrove tree, also known as "forest above the sea", is a kind of tropical tree, growing in swampy ground along sea coasts and river banks. In 1980, China's first nature reserve was established there by the local government, with a total area of 4,000 hectares. There are 81 kinds of mangrove trees in the world, and 32 kinds of them can be found in Dongzhaigang. Besides containing mangrove forests, the area is also home to many rare birds, attracting lots of biologists and travelers visit there to discover the reserve's unique flora and fauna. Qixia Mountain, also named as Sheshan Mountain, is located about 22 kilometers northeast of Nanjing City (the main city along lower reaches of Yangtze River where you can have Yangtze River tour), Jiangsu Province. It covers an area of over 860 hectares, and has three peaks - Dragon Peak, Tiger Peak and Fengxiang Peak, with the highest peak at 286 meters. 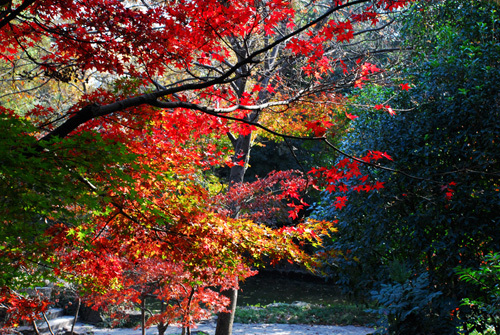 Covered by 750 hectares of various maple trees, the mountain has fascinating scenery in autumn. Around the middle of October each year, the whole mountain will become a colorful carpet, with flourishing red, green and golden maple leaves, making it a wonderful place to enjoy fall colors. Situated in the south of the Ganzi Tibetan Autonomous Prefecture in southwest China's Sichuan Province, Daocheng County is often referred to as "the last pure land in our blue planet." At an average elevation of 3,800 meters, Daocheng is renowned for its magnificent mountains, white glaciers, broad valleys, lush pastures and picturesque lakes. Forests, grasslands and creeks can also be found in the grand valley, fringed by splendid snowcapped mountain peaks. After September, the area goes into colorful autumn, attracting hundreds of visitors to travel and hike there and enjoy some of the quietest and purest natural scenery on Earth. Xi'an, located in northwest China and starting point for your Silk Road tours, is known as one of the four ancient capitals of the world, together with Athens, Cairo and Rome. Home to the Terracotta Army, the city has a long history of more than 3,100 years, including 1,100 years as the capital city for 13 dynasties. When travelling in Xi'an, you can not only visit Terracotta Army, City Wall and the Beilin Stone Sculpture Museum, but also can have a taste of the culture from Tang Dynasty in Tang Paradise Recreational Area and Huaqing Palace. While appreciating Xi'an's history and culture, don't forget to try some distinctive local snacks. Yang Rou Pao Mo (unleavened bread in mutton stew), mutton kebabs and cold rice noodles are among the most popular regional food.